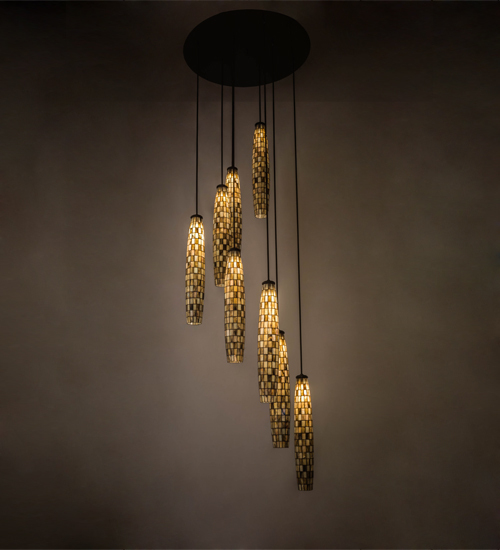 Description: Checkers is an exquisite fixture featuring eight shades with cylindrical profiles of hand cut rectangular pieces of Tortoise Shell Beige and Wispy Sky Beige art glass. Each stylized art glass shade is created using Meyda Tiffany's famous copperfoil construction method. Complemented with Timeless Bronze finished hardware, this fixture is available in custom sizes, styles, colors and dimmable energy efficient lamping such as LED. The pendant is UL and cUL listed for damp and dry locations.